After his sweeping victory in the New Hampshire primary Tuesday, Sen. Bernie Sanders met with Rev. Al Sharpton in the historically African American neighborhood of Harlem in New York City on Wednesday morning. 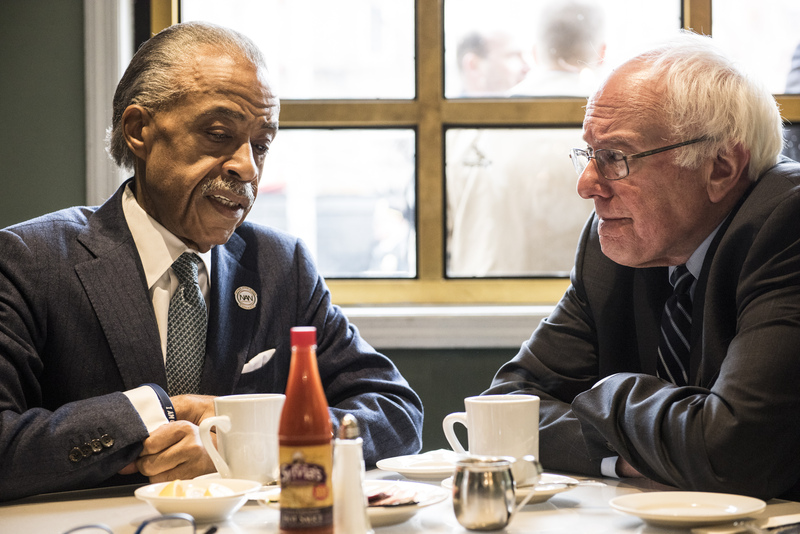 The senator and the civil rights activist sat down for breakfast at the famous Sylvia's Restaurant to discuss issues impacting the black community. It's a demographic that Sanders is going to need to win over if he wants the ultimate edge over Hillary Clinton. As of January, 71 percent of black and Latino Democratic voters chose Clinton for the nomination, according to the Monmouth University Polling Institute. In a press conference following the breakfast, Sharpton said that he spoke with Sanders about the water crisis in Flint, Michigan, police brutality and misconduct, and the future of affirmative action, which could be in jeopardy depending on how the Supreme Court rules this year in the case Fisher v. University of Texas. During the press conference, Sharpton expressed concerns about the African American community's future when Obama's presidency ends. "In January of next year, for first time in American history, a black family will be moving out of the White House. I do not want black concerns moving out with them." Sharpton said. While Sharpton has not endorsed any candidate, Benjamin Jealous, former NAACP president, reiterated his support for Sanders at the press conference. "There is no candidate in this race who is fiercer in standing up for those who need allies in the struggle than Bernie Sanders," Jealous said. Even though Clinton tends to poll better among minority voters, Sanders has garnered an approval rating of 100 percent from the NAACP during his time in the Senate. At the Iowa Brown & Black Forum on Jan. 11, Sanders was asked what he would say to a white student who feels that their access to education is limited by affirmative action. He responded: "[I]t's time not to play off white against black. It's [time] to make sure every kid in this country regardless of income can get a college education." After Black Lives Matter protesters interrupted several of Sanders' speaking events and he met with some of its members, Sanders created and presented a racial justice platform for his presidential campaign. After hiring black activist Symone Sanders as his press secretary, Sanders specifically developed sections on police and criminal justice reform. There are no excuses. The governor long ago knew about the lead in Flint’s water. He did nothing. As a result, hundreds of children were poisoned. Thousands may have been exposed to potential brain damage from lead. Gov. Snyder should resign. Sanders has earned endorsements from prominent members of the black community, including activist Dr. Cornel West, several South Carolina state legislators, and Ohio state legislator Nina Turner. Sharpton did not officially endorse Sanders, saying that he is waiting to decide whom to endorse until after he meets with Clinton on Feb. 18. There is something profoundly wrong when African American men are still far more likely to be stopped and searched by police, charged with crimes, and sentenced to longer prison terms than are meted out to their white counterparts. There is something wrong when a third of all black men face the prospect of prison during their lifetimes. After Iowa and New Hampshire, Sanders' next challenge will be garnering the minority vote in South Carolina — and based on his breakfast with Sharpton, he is wasting no time doing do.